1. 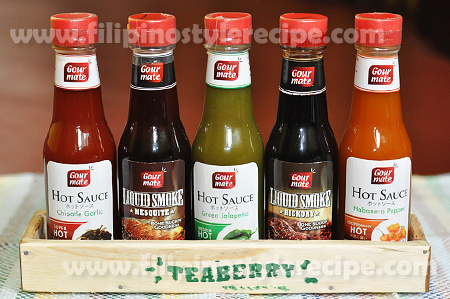 In a bowl, prepare the marinade by combining the soy sauce, soda, pineapple juice, brown sugar and garlic. Mix until the sugar is dissolved. 2. In a flat and clean surface, arrange the carrots, hotdog and cheese at one edge of the meat. Roll to form like a log. Secure with string. 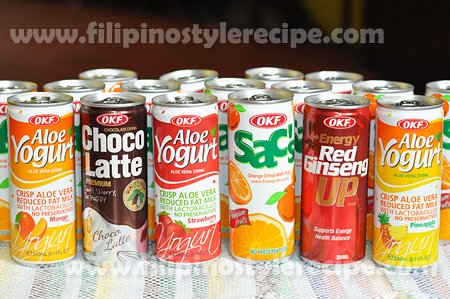 Do the same for the rest of the ingredients. 3. 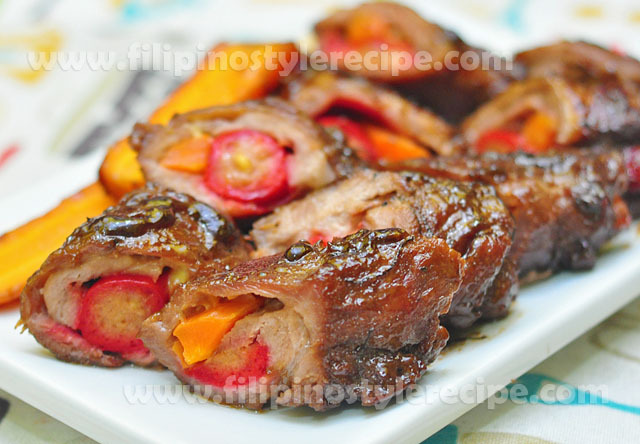 Put the rolls into a container and pour the soy sauce mixture over it and marinate overnight or for at least 1-2 hours. 4. Once ready to cook, heat pan with oil, put the meat and sear on all sides until light brown. Get 1 cup from the marinade and add to the meat. Simmer for 30 minutes, flipping the meat from time to time, until the sauce is thick and the meat is cooked.You may add sauce if the meat is not yet cooked. 5. Once cooked, remove the meat from pan. Cut the string and slice pork into serving pieces and transfer to serving dish. Pour the remaining sauce over the meat. 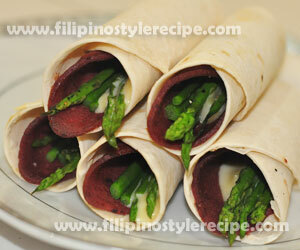 Filipino Style Recipe: Asparagus Salami pita Rolls is another easy and simple Filipino meryenda(mid-afternoon snack). This dish is made of pita bread or soft tacos stuffed with salami, asparagus, cheese then season with salt and pepper then toast for a few minutes. 1. In a pot, boil water with salt then add asparagus. Cook for 1-2 minutes then drain and set aside. 2. In a pan, heat oil then fry salami for a minute. Drain on paper towels and set aside. 1. Place pita bread in a flat surface then arrange salami slice. 2. Arrange 4-6 pieces asparagus and cheese slices. 3. 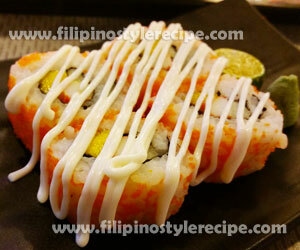 Sprinkle with salt and pepper then roll. 4. Repeat the procedures for remaining pieces. 5. Pre-heat oven over 220 degrees Fahrenheit for 10 minutes then toast pita rolls for 5-8 minutes or until the cheese melted. Serve! 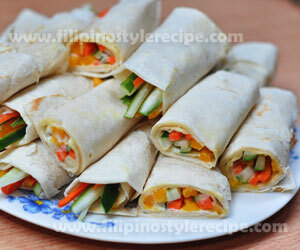 Filipino Style Recipe: pita rolls is another simple and easy Filipino meryenda(mid-afternoon snack). 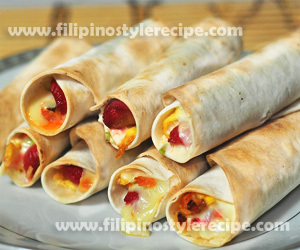 Pita roll is made of pita bread or soft tacos stuffed with hot dogs, scrambled eggs, mayonnaise, lettuce and cheese then toast for a few minutes. 1. In a pan, heat oil then stir fry hot dogs for 1-2 minutes. Drain and set aside. 1. In a same pan, saute onions and tomatoes until soft. 2. Pour beaten eggs then let it begin to set before slowly stir until turns to fluffy texture. Drain and set aside. 1. Arrange the filling over each pita bread then roll. 2. Repeat the procedures for remaining slices. 3. Pre-heat oven over 250 degrees Fahrenheit for 10 minutes then toast pita rolls for 5-8 minutes or until the cheese melted. Serve! 1. 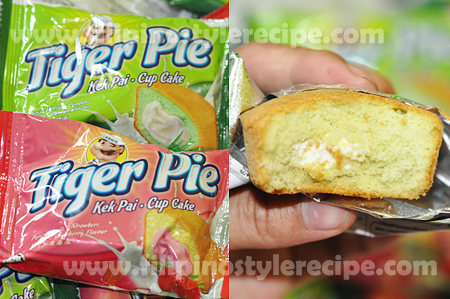 You may customize the fillings based on what you like. 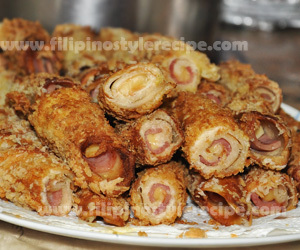 Filipino Style Recipe: bread roll is another simple and easy Filipino meryenda(mid-afternoon snack). Bread roll is made of loaf bread slices stuffed with ham, cheese and bell pepper. 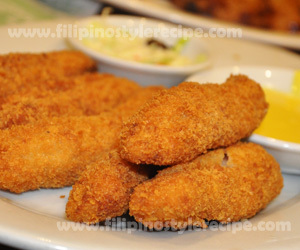 Dip in beaten egg and roll over bread crumbs then fry until brown. 1. Cut off the outer layer of the bread then flatten using a rolling pin. 2. Arrange the filling over the bread then roll. 3. Dip the roll in beaten egg then roll in bread crumbs. Set aside. 4. Repeat the procedures for remaining slices. 1. In a frying pan, heat oil then fry each roll for 1-2 minutes or until browned. 2. Drain on paper towels then cut into half and arrange in a serving plate. Serve.